HANK PHILLIPPI RYAN: Whatever you call it--the universe, serendipity, luck, chance, whatever--there are things we cannot control and cannot imagine our lives without. I am not going to yammer any more about his, because--what if I hadn't met Cindy Callaghan at Pennwriters a couple of years ago? I'll tell you what if. We wouldn't be reading this blog today. And Cindy's story is amazing. But please note: The second paragraph has a bombshell, which, Cindy being Cindy, she just barrels right by. So let me give a headline: Her new book is now an AMAZON TV pilot. Whoa. Once upon a time there was a newbie writer (me) with an idea: Freckle-faced Kelly Quinn and her Secret Cooking Club. I’m going to uber sum up several years of toil, tears and cheers to give you a glimpse into the stream of events that led me here: The Just Add Magic pilot on Amazon, which BTW is now available. 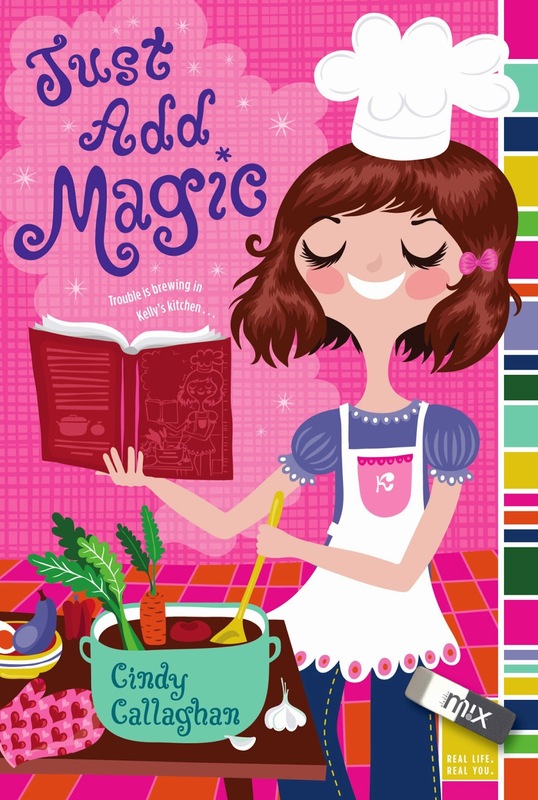 Kelly Quinn’s Secret Cooking Club, retitled and published Just Add Magic, landed me a literary agent and first book contract. Shortly after its release my agent and I went our separate ways leaving Just Add Magic unrepresented and all rights reverting to moi. But lightning struck twice when I signed with a like-minded agent who saw promise and passion in me. Hallelujah! Together we’ve sold four more books to Simon & Schuster. YAY! However, I continued to believe that Just Add Magic had more in its future - the screen. So, now I’m totally freaking out. Totally. What did it feel like? Mostly this: The school where we filmed was filled with people – actors, extras, cinematographers, directors, security, food service people, set and costume designers, make-up artists, etc. etc. They were all there for something that was in my head, an idea of freckle-faced Kelly Quinn and her secret cooking club. Does that thought give you chills? It does to me. Every time. What if my first literary agent hadn’t let me go? What if my roommate wasn’t on Facebook? What if we’d never met for lunch? Please watch the Just Add Magic pilot, rate it, review it. I will be posting filmy type stuff all month, so please visit me on my website. HANK PHILLIPPI RYAN: Oh, my gosh. I am in AWE. Fabulous. What if I hadn't met Hallie at that writing class in 2004? What if I hadn't interviewed Sue Grafton in 1999? What if I hadn't gone to Nantucket that weekend in 1997? What're your what ifs, dear Reds? And don't forget to watch Just Add Magic! YAY, Cindy! 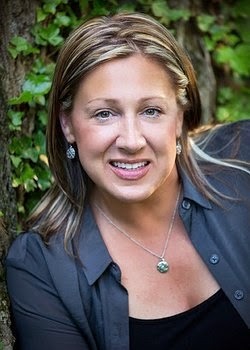 Cindy Callaghan grew up in New Jersey and attended college at the University of Southern California before earning her BA in English and French, and MBA from the University of Delaware. Cindy is the author of JUST ADD MAGIC (2010), LOST IN LONDON (2013), LUCKY ME (2014), LOST IN PARIS (March, 2015), and LOST IN ROME (June, 2015). All of Cindy’s novels are published by Simon & Schuster’s Aladdin M!x. Cindy is also working with Amazon Studios on an original series based on her debut novel, Just Add Magic. She recently exited corporate America after nearly twenty years, and is now fully entrenched in writing, and family. Cindy lives, works and writes in Wilmington, Delaware with her family and numerous rescued pets. Congratulations, Cindy . . . I'm looking forward to seeing "Just Add Magic" . . . what an amazing, magical story! What if we'd never discovered this wonderful Jungle Red Writers blog? Think of all we would have missed . . . .
Congrats! I hope the show goes well for you and the books continue to do well. My What Ifs - what if my agent hadn't come to the SINC New England chapter president in 2011 looking for authors to work on proposals with? What if I hadn't joined SINC-NE in 2005? What if I hadn't started writing a novel when I was laid off a job in 2008? And so on! Great story of your adventure to this very exciting moment. The Just Add Magic pilot is lots of fun, and as I have been spouting everywhere, features Nice Girls. We need more nice girls! My what if: What if I hadn't had twins? Then I wouldn't have gone to the Mother of Twins meeting in Indiana PA, where I met fellow MoT and author Gloria Dyal, who introduced me to her writers group and Nancy Martin. Also, I never would have written for TWINS magazine, in particular the summer long project on mystery series featuring twins, where I had an in depth course on the mystery genre. All led to where I am today. And happy to be Cindy's friend! Congrats, Cindy! The pilot sounds fun - I'll have to see if I can check it out (not an Amazon Prime subscriber, so I don't know if they want my vote). I love your voice in this blog, so I'm sure the book/TV show is just as fun. What if I'd walked away from that first SinC meeting? What if I hadn't been fired? I don't think I'd be where I am, but for those two things. What a GREAT story!!!! I love stories like this. And now have a big ol' smile on my face, thank you very much. Whatever you're doing, Cindy, keep it up. It's easy to read the success in Cindy's blog. But look at all those "Then I waited months." Through it all she was optimistic and upbeat. Wish I were more so. There cannot be ups without downs , right KB? I think the key, as Cindy so beautifully demonstrates , is that things just have to align -- and we have to be ready when they do! Cindy also demonstrates that sometimes a disappointing leads to a wonderful thing. You just never know ! So Cindy -- who wrote the scripts ? Will seeing this pilot change how you write the next book? Love this story, Cindy! Congratulations! The scary thing in this business is how much is out of your control. My big WHAT IF is what if I hadn't gotten bumped off an oversold plane to Ghana summer of 1968 and had to stay in NY and fall in love instead. I love this story, Cindy, because it demonstrates everything that is true about writing: You need hard work, persistence, a writing community AND a sprinkle of serendipity to make things come true. Can't wait to see the series. A million years ago--it was 1980, actually, I was working in Atlanta, happily on TV as the weekend anchor. I was offered a new job by this weird new organization--they had decided they were going to do 24 hour a day news. On cable. And they wondered if I wanted to be the Los Angeles bureau chief. Oh, thanks so much, I said. But Im happy where I am. BUT! I still made the right decision! Again--you never know. What a great story. How very cool, to be in the forefront of this new media trend, too. My "what if": If I had not gone back to the Friday night watering hole to meet my friends after getting irritated that they were late, again. I went home to have something to eat and went back, and they introduced me to my future husband, who was sitting with them while they waited for me, for a change. It still leaves me a little breathless to think how chancy life can be. Wow, Karen. SO amazing--just that one little moment, that one litle--we think!--decision. And HE decided to wait, too. ALmost scary. Or very cool. It gives you shivers, how random life is, doesn't it? A friend just recently decided to read just one more chapter of the book she was reading, and narrowly missed being involved in a terrible accident. The same thing happened to me once: I was driving home in a rainstorm, and had to stop for a second because my contact has slipped off my eye. A few seconds after I stopped I heard a horrific crash, but couldn't see anything. When I started the car again there was a massive tree over the road, right where I'd have been in my little Honda. I love this blog post. Huge Congratulations, Cindy! I found it via a tweet I was mentioned in (@petxpert). I haven't see Hallie in eons (Does the name Darlene Arden ring any sort of bell, Hallie?). I'm an avid reader, adore mysteries and write non-fiction. Cindy, your story sounds almost like a Cinderella story! Congratulations, and the best of luck in the future! I'll be looking out for your name! Magic!!! Love this and will watch the show! Congratulations. Was hoping Cindy would drop in today to chat. Hank do you know what age range she writes for? Cindy, what a thrill! An Amazon show based on your books. Congratulations! I will be checking it out. My biggest "what if" is what if I hadn't waited for a girl I knew in my education classes that wanted to walk over to the student union with me at the beginning of my last semester in college. I really wanted to go on and get over to the student union, but I decided I'd wait for her. My husband was a friend of hers and saw us walking together. He got my number from her, and we ended up getting married, having two great kids and so far two great grandkids. I came very close to missing that. Another huge what if is what if I hadn't gone to my first Bouchercon in Albany, red the Reds before going, attended their panel, and found Jungle Red Writers Blog. Whoo! I just saw THE LAST SHIP with Sting! Anyway, yes, sorry Cindy missed the day...we'll see if we can get her to stop by tomorrow! Joan, Love that "What if..."
The pilot is aimed at ages 6-11. And my books are "tween", best for 9-12. My "sweet spot" is 10. And, I think conferences are a great 'what if...'. There's just something special about them...the crowd, the vive, the energy....interesting things happen. Dear Ramona *Jumps up* Hey girlfriend!! Mary Sutton, Thanks for your interest. You don't have to be a Prime member to watch the pilots. It's FREE!! How many things can you say that about, am I right? Not sure if you are into pilots, but I have watched them all. I like some better than others. I happened to have loved MAD DOGS and I keep thinking about it and really hope that one gets made into a series. The scripts were written by the amazing duo of Lewis and Sungco. I'm so lucky that they were like-minded. There are general concepts for the rest of the episodes should we move in that direction, but I can already see how some of the viewer feedback might adjust some of the thinking. As far as how I write my books: I LOVE LOVE movies, actually went to see American Sniper last night, and I like to think of my scenes very visually. I think this really helps cut out unnecessary fluff. Where would a movie scene start/end? Honed in on the expression of someone's face? Or is wide-screen? Depends what you are trying to achieve. Also, I think it helps sharpen dialogue. OMG, YES! Soooo much is out of control... The recipe might be: A great piece of work, a great pitch, a strong network, and a little luck. What gets me sometimes is when you see unpublished friends' work and you just KNOW that it's great. I have a friend who writes better than me and than a lot of the published stuff that I read, but she can't seem to catch an agent. That's where another element of luck comes in..Timing. It's going to pop for her, I know it, the timing just has to be perfect. I love romantic 'what ifs'...'. This whole notion that Hank has floated on this blog makes me think a lot of what I call the "Sliding Doors Effect." Maybe there is an official name for that, but that's what i call it. Not sure if you've ever seen that movie, but it's kinda like.."I turned right when I could have turned left..." Or, "I took the road less traveled, and that has made all the difference." When there is romance involved, it has an extra chill. Doesn't it? Thank you for having me today (well, yesterday now, depending on your time zone). I am so so sorry I didn't pop in throughout the day. I hope you'll forgive me. It was one of those days when..well, quite frankly, the day job totally exploded and took over. Just when I had a minute for the restroom, the phone vibrated. You know the kind. When I have a day like that - in this case it had been a week - I do one of my favorite things...I escape to the movies. I go all alone and get completely lost in the story. Completely lost. In this case I was in Iraq with Bradley Cooper. Man, I'd go anywhere with him. I've always loved the movies, which is an interesting way to wrap up this blog-day. I love writing, and I love the movies.... TV pilot seems such a perfect combination. It gives me chills, it really does. Thanks again. Nice to 'see' some old friends and some new ones!